The April full moon will occur on Friday, April 19. For all Christians except the Orthodox, it is good Friday. And on this day ascend to the firmament of the so-called «Pink moon». Of course, it actually is not painted in pink. The fact that the last time the full moon each month began to give the name, as was customary in the culture of native Americans (in March the moon was «Wolf»). «Pink moon», according to the old farmer’s Almanac (Old Farmer’s Almanac), so named because of the appearance in April of the first field of spring flowers, in particular wild Phlox. In the U.S., these flowers are often called «pink moss». Astronomers recommend to climb the hill, to see the moonWhen watching «Pink moon»? Best of all – early on the morning of Friday, April 19. In Los Angeles moonset will occur at 6:44 am Pacific time, and the rising of the moon at 19:59. In new York, moonset at 6:38 am Eastern standard time, sunrise is at 20:01 PM. Don’t forget to check the exact time of sunrise and sunset of the moon in the place where you live. 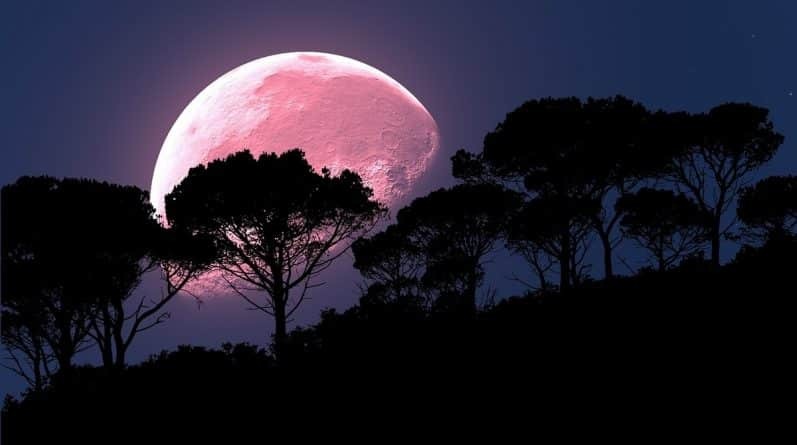 If the weather or work doesn’t allow to admire the full moon, know that «Pink» the moon will look almost as the day before and the day after the actual moment of the full moon. So to get a great shot and can Thursday, and Saturday. Astronomers recommend to climb the hill, to see the moon. Will fit a skyscraper, a hill or even a third and higher floor of an ordinary house. Don’t need any special equipment, but any binoculars will give you an incredible close-up. The next full moon will occur may 18, 2019 and will be called the «Flower moon».